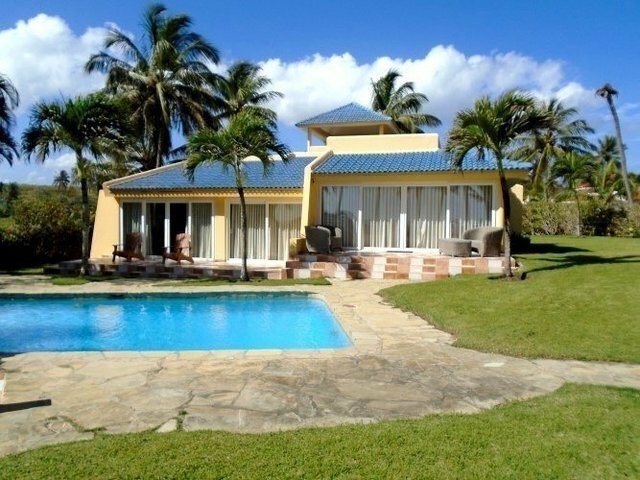 LUXURY BEACHFRONT VILLA IN CABARETE This spacious and luxurious villa is located in a small closed community on the beach just outside Cabarete. The house is built on a plot of 1224m2 (13175 ft2) fully enclosed by an ornate wall of natural stone with private access to the sandy beach. The living area of the house is approximately 300m2 (3229 ft2)and has 4 bedrooms, two with access to a terrace next to the pool, 3 bathrooms, spacious living room with lounge with access to the garden and pool, a large fully equipped open kitchen with appliances. All rooms have air conditioning and fans and other parts of the house have fans. The property is well maintained and sold fully furnished except personal items. There is parking space for 2 cars under the covered carport. The residence has 24/24 and 7/7 security. The international airport of Puerto Plata is located at 18km (11.25 mi) from the residence and can be reached in 20 minutes. For more specific information regarding this property do not hesitate to contact me. The city center is located 1.6 km (1 mi) from the residence. The property is located 300 m (0.20 mi) from the main road where you will find public transport to the center of Cabarete. The garden is beautifully landscaped and well maintained with the pool along with a small building for storage with a small outdoor kitchen.